We love Organic and Natural don't we? Then why not feed the same to your website for long lasting search Visibility in keyword search; added Bonus your website popularity and trust will increase giving you Actual Top ranking in the near future.
" Search Engine Optimization (SEO) is the process of editing website code and content to build authority and relevancy for keywords for the purpose of increasing the amount of organic search engine traffic (Google, Bing, Yahoo!, etc.) to your website." SEO is what helps search engines find your site in the vast sea of the Internet. This is why startkaro.com, a SEO & Digital Marketing company, works closely with you to develop custom campaigns for businesses of all sizes. The Internet is not "one-size-fits-all" which is why we build you a well-conceived and custom White Hat SEO strategy, complete with proper implementation, so your site will gradually climb towards the top of the search engine queries until eventually becoming a reliable source for the keywords that your Business Website is in the top Listing. When you use startkaro.com as your Digital Marketing services partner, we will conduct a thorough Audit & analysis of all aspects of your website, at the same time we research and analyze your competitors Website. We will review the code and web analytics, identify any problems, find new opportunities and areas of improvements. We then use findings and work together to develop the perfect campaign to meet your desired results. 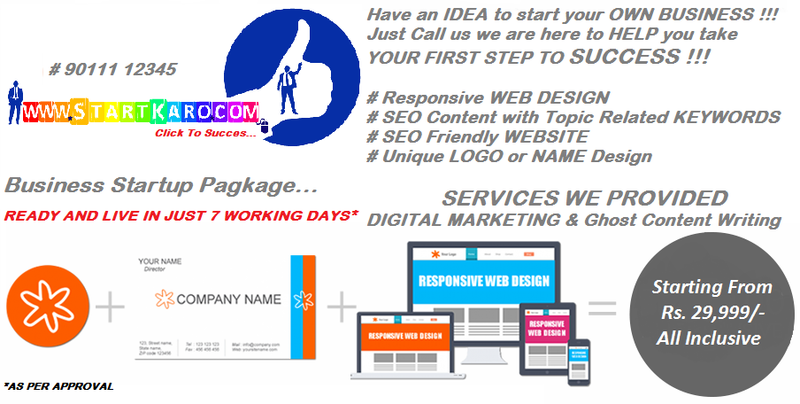 Our website optimization along with our Digital Marketing services will drive revenue and build your brand with the help of Digital Marketing and Search Engine Optimization . While we're doing this, you will be getting weekly reports which will keep you updated on your Internet campaign progress and deliver to you a detailed benchmark report with existing keyword rankings and historical, organic search traffic. You will know exactly where you stand when we start, which will help track progress along the way.